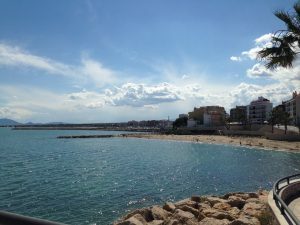 Beaches across the Terres de l’Ebre have been awarded blue flags this year, including local favourites Sant Jordi (L’Ametlla), Cap Roig (L’Ampolla) and Riumar on the Ebro Delta. The blue flag is an internationally recognised symbol of meeting strict environmental and safety requirements. Across Spain, a total of 579 beaches now have blue flags along with 100 ports and five eco-tourism boats. This makes Spain the country with the most blue flags in the world, followed by France, Greece and Turkey. Catalunya was awarded 119 blue flags this year (95 beaches and 24 ports) – this is three beaches fewer than last year. The province of Tarragona, however, gained two new blue flags this year, and has a total of 42.